A dryer that that produces a squeaky sound while it's operating could have one of three issues. A squeaky sound is caused by the belt, idler pulley or drum rollers that have become defective. Once you know how to fix a squeaky dryer belt, you will be able to repair the part that is causing stress on the belt. All of these parts can be replaced by the typical do-it-yourself homeowner. Disconnect the power supply from the clothes dryer by removing the plug from the wall outlet. Remove the control panel from the top of your dryer. Most models attach the control panel by using two screws at the end of the panel. Set the control back away from the immediate work area without removing wires. Remove the top panel of the dryer by either disengaging the retaining clips that hold it down or by removing three screws at the rear of the panel and then sliding it off. Use a screwdriver to remove the screws that connect the front and sides together. 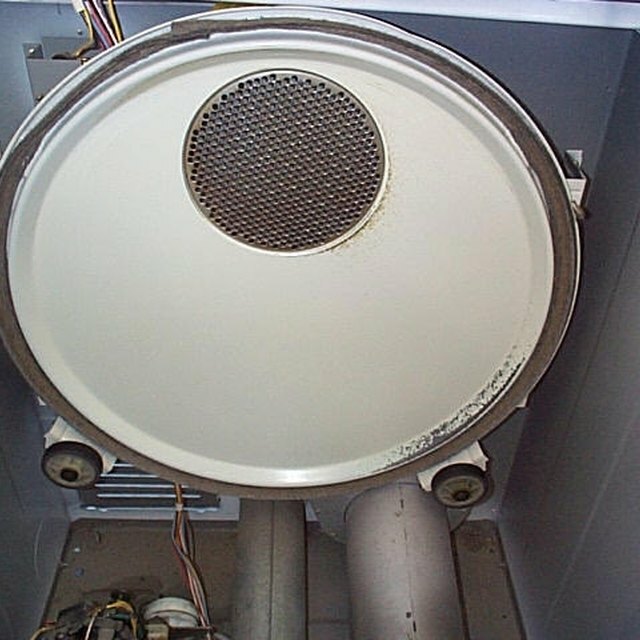 Swing the top of the front panel out, and then lift it up off of the retaining tabs on the bottom of the dryer. Inspect the belt for wear or damage. A stretched belt will make a squeaking sound when the dryer is in operation. The belt should be tight with no visible damage. If it is loose, damaged or broken, replace the belt. Reach under the side of the drum by the drive motor and push the idler arm back to release tension on the belt. Remove the belt from the idler pulley and the drive motor pulley. Grab the belt with one hand and the drum with the other hand. Lift up on the drum and slide it out of the dryer with the belt. Inspect the idler pulley by attempting to spin it with your finger. It should spin freely. If it does not, replace the idler pulley. Unhook the idler pulley from the base of the dryer and place the new idler pulley inside. Inspect the rear drum rollers that the drum rides on top of. These should also spin freely. If you need to replace one drum roller, replace them both at the same time. Use a screwdriver and socket wrench to remove the triangle clips and the bolt that hold the drum roller on the shaft. Pull the drum roller off and replace with a new one. Place the belt around the drum and set the drum back into position inside the dryer. Route the dryer belt around the drive motor pulley and the idler pulley. Pull the idler pulley back down to apply tension to the dryer belt. Reinstall the front panel and the top panel of the dryer. Reconnect the control panel to the top of the dryer. Plug the dryer back into the wall socket. Always disconnect electrical supply to appliances before attempting repairs.